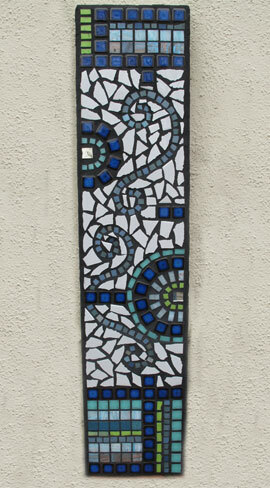 I had some pieces of wood left over and decided to make a three-piece mosaic wall-hanging for the garden. 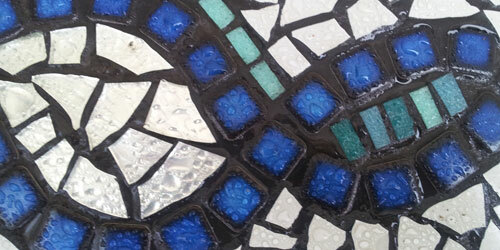 I like to used mixed media, and combined broken white tiles and mirror with a variety of mosaic tiles. I also like to make the pattern up as I go along, letting the pieces influence how it will look. 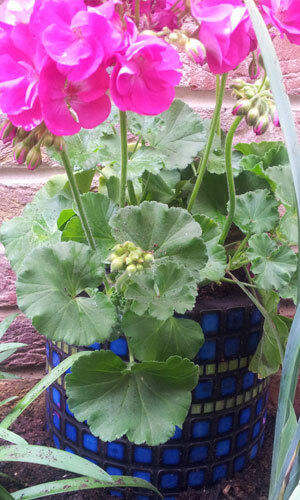 These pots started out life as terracotta roof tiles, that I picked up from a local reclamation yard for pence. 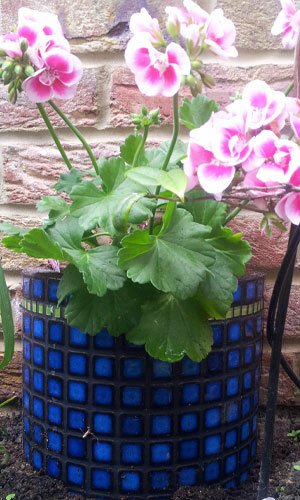 They are a semi-circular shape, which I covered with mosaic and grouted with an outdoor grout. I glued weed control fabric to the back to create a container for my plants, dug them into the ground and filled them with soil. They really add a nice splash of colour to the garden, which will look good all year round. I had some spare wood left over from making a border for the veg plot and thought I would put it to good use. My husband made a small flowerpot bench for me and I got to work adding mosaic to the top of it. I used a mixture of broken mirror, white tiles and my favourite blue tiles (I have literally hundreds of these and they appear often!). Unfortunately, I hadn’t realised that treated wood expands and contracts with the weather and the grout soon cracked and the mosaic broke apart lol. Lesson learned: make sure to use a solid base, for example, terracotta, chip board, ply wood or glass.